The winter windy season is coming to an end in southern Baja. It’s Easter weekend and the population of the village has more than doubled the past few days, and it’s not because of an influx of wind enthusiasts. In Mexico it’s a tradition to pack up the family and head for the beach during Semana Santa. The campground was nearly empty of kiters and windsurfers on Thursday, but was packed to capacity by Friday afternoon. Last night we could see campfires on the beach from La Ventana to the lighthouse 9 miles to the east…the party is on. It was a fun packed season both on and off the water. Late summer and early fall brought some badly needed rain and storms to the southern half of the Baja peninsula. The Baja water supply is dependent on the rainy season and in dry years the plants, animals, and people can suffer. On the drive down in mid October, the mountains and deserts of southern Baja were beautiful, lush and green. There have been seasons here where a shower is the only rain we’ll have in 6 months, but this year Nature blessed the region with much needed water. 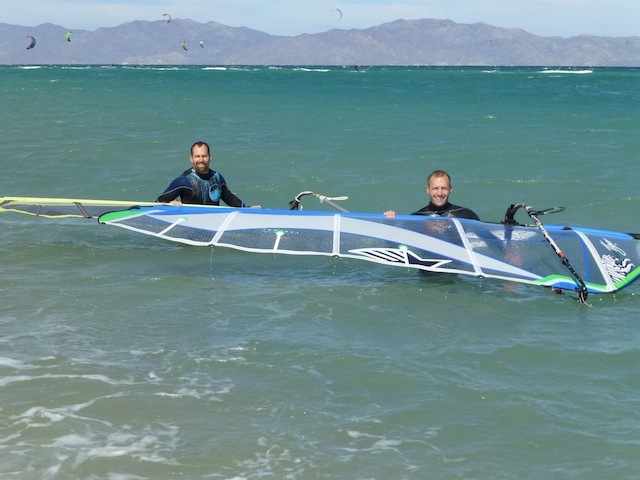 The winds were a little slow in developing in the fall, but fortunately I had brought down a 5.3 and 5.7 Panther Elite for demos, and everyone quickly found the lightweight and power of the new 4 batten sail to be very sweet in light winds. From October to mid November the majority of days had light winds. The typical Norte pattern didn’t really get going until December. It seemed that the forecasts of strong winds seldom turned into reality on the water. For whatever reason the typical north wind patterns were inconsistent through much of the season, and a strong sub-tropical jet stream brought untypical periods of overcast skies from Christmas through February. I think the overcast cut down on the afternoon thermals that usually give a boost to our wind every afternoon. What’s the old saying…you can’t change the wind, but you can adjust your sails? I think most people found a combination of sail and board size that increased the fun factor; I found the solution was sailing my bigger board which let me sail in the up and down conditions, but still make it home if the wind dropped. The 2013 Panther Elite and Tiger are the sails I brought down for people to demo. The new 4 batten Elite was released just before we left the Gorge in the fall, and the 5 battenTiger continues for 2013 with a new panel layout and calibrated down haul system. Interest in David’s newest 4 batten design was pretty intense, and was the “talk of the beach”. Personally I love the new sail’s light and balanced feel with no loss of power or range. 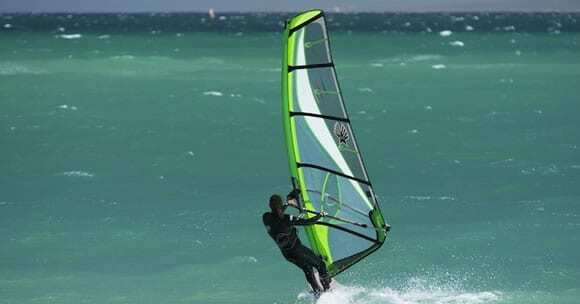 I think that sailors who thought that a 4 batten sail would be a radical change from how Ezzy wave sails have performed in the past, were surprised and instantly won over by the Elite. I’ll be demoing the Elite and Tiger this summer in the Gorge, plus the new Legend. 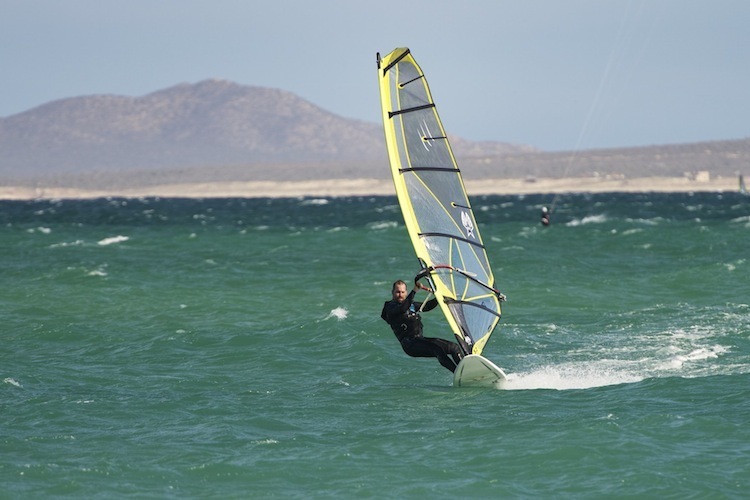 Southern Baja and La Ventana in particular is a wonderful place to sail and share the windsurfing lifestyle. It’s amazing how many people find a way to spend the winter sailing and enjoying this special place. 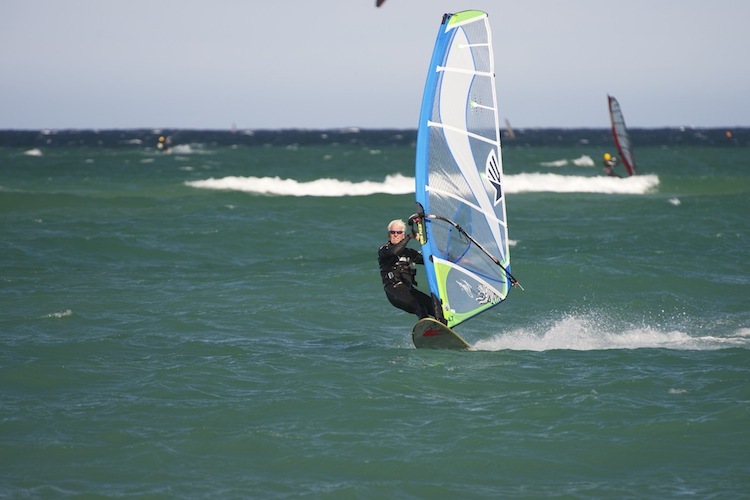 And it’s not just sailors who have retired early or decided to “sail now and work later”…no one seems to care what your title was or what you did in you pre-windsurfing life. 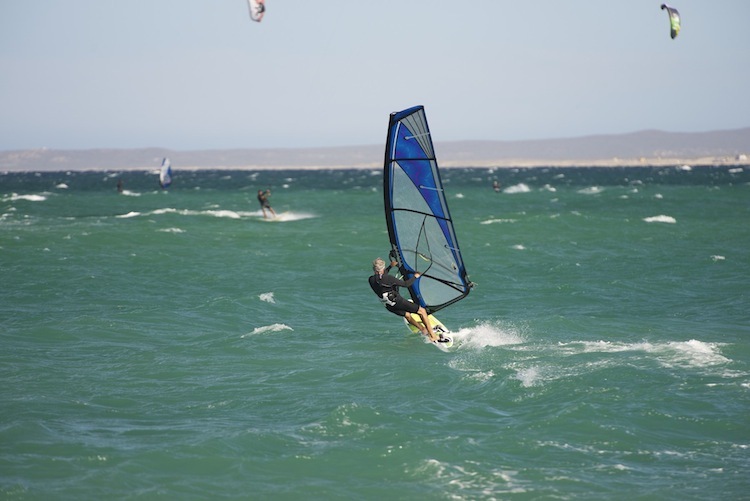 Sailors are here for one reason; to share their passion and love for windsurfing with other windsurfers. A great example of sharing the passion was in February when two brothers spent a week here learning and working on the basic skills that are the passports to high wind sailing. From Eric nailing his water starts, to Pat getting comfortable in the straps and harness…the cheers of encouragement coming from other sailors with each successful step, let them know they weren’t alone in their struggles. Watching the young sailors reminded us how challenging and rewarding learning to windsurf can be. Pat said it best, “of all the sports/activities that I’ve been involved in; I’ve never experienced such thrilling rewards from learning each next step. It just keeps you coming back for more”. Pat and Eric…the smiles never stopped. 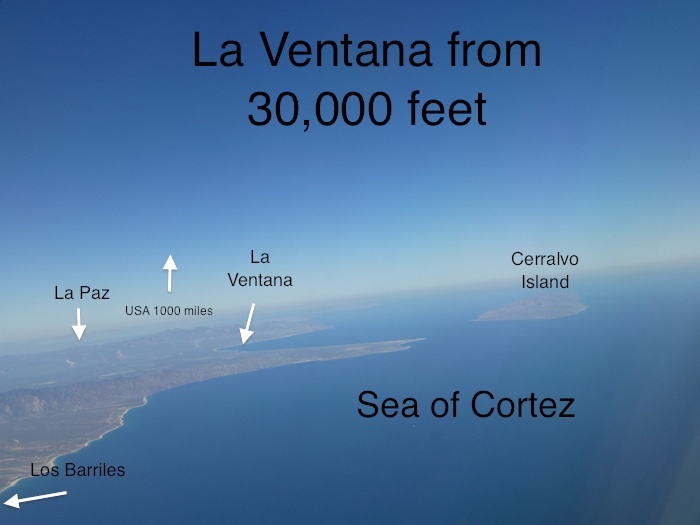 The La Ventana campground is the central gathering place for wind enthusiasts coming to the area from October to March. I would estimate that there are several hundred people during the peak of the season this prime piece of real estate on the Sea of Cortez. Los Barriles, 35 miles south is the other major gathering place in southern Baja during the winter months. Pat with feet in the straps and on a plane…he’ll never forget this day. The La Ventana/El Sargento area has experienced a major boom in development over the past 12 years we’ve been coming here. Our first winter here in 2001 the villages were just beginning to welcome winter visitors. Baja Joe’s was the only established resort and there were only a couple restaurants and taco stands. A handful of American & Canadians had purchased property and/or built a home. There were only two public telephones and no Internet or cell coverage. What a difference a decade can make. I would estimate that several hundred homes have been built by people who have decided to make La Ventana part of their lives. We even have cell phone coverage and DSL in the villages. Meet me in the Gorge this summer and I’ll get you out on the new Panther Elite.